We are starting to have a glut of zucchini – courgettes in the garden. If you grow them, you will know what happens here. Everything in the garden looks lovely, you have plants with lots of baby courgettes growing nicely and everything is looking fine and dandy. Then one morning you come out and overnight they have grown into monsters. Enormous courges threatening to take over the whole garden. You may think that huge courgettes are a bonus, but they get pretty tasteless after a certain size. So the trick is to pick them quickly and cook them. But how to prepare them, should you spiralize, grate, slice or chop? Then how to cook; fry, steam, bake? And then what recipe? Last week it was a simple chop then fry in garlic butter, this week we have already had Zoodles. Spiralize and steam. Today I am thinking grate them for fritters. How to create these I’m thinking why reinvent the wheel. 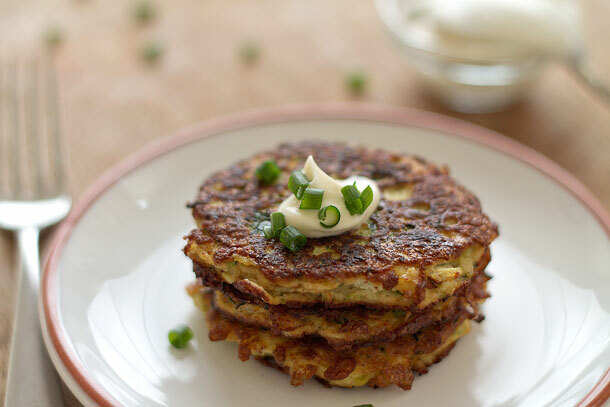 So the following is a fritter recipe from Slim Palate, which looks simple and quick to make. So I’m giving these a whirl. oil for frying around 2 tablespoons of walnut oil/avocado oil or coconut oil. Serve with a dollop of sour cream or some Mayo.